If you are thinking about installing a wine cellar in your property, there are a number of considerations that you should keep in mind. The process of adding a cellar to your home requires a lot of planning and preparation. While determining the location for your wine storage is an important first step, there are other facets that dedicated enophiles should give as much due thought to, if not more. This article will discuss the core factors and elements that go into constructing the perfect wine cellar for your property and wine collection. Wine enthusiasts will know that installing a wine cellar in their home is a true investment and therefore, putting the correct preparation in place will ensure that no elements are overlooked. Finding the right craftsmen to bring your wine cellar vision to fruition is one of the most vital aspects of the construction project. A contractor must have the technical abilities and proficiency in the proper techniques of installing a wine cellar. Ensure that the contractor you are working with has experience and knowledge in areas such as vapor barrier, proper insulation, glazing options and exterior grade doors. The location and size of your wine cellar will have an impact on many other elements that are involved as part of adding wine storage to your property. Many enophiles are now moving away from the traditional placement of a basement for their cellars and are choosing to have their wine collections become a focal point in a room that is used for dining and socializing. It is important to note, however, that wine cellars are best placed in a location that has a temperature of at least 12 degrees Celsius and a 60% humidity level. When determining the location and size of your cellar, give consideration both to the current size of your wine collection and how big you expect your collection to grow. Modest collections can be incorporated into your living space with a self-contained wine cooler, but if you have expectations of a collection of more than a couple of hundred bottles, locating your cellar in a basement may be a better option in terms of available space. The cost of a cellar project can vary depending on how you envision the design of the wine storage space. Size, location, choice of cooling unit and materials must all be factored in when budgeting for the project. Many enophiles aim to create a particular atmosphere with their cellar and, as a result, the design of a cellar can vary greatly. Depending on personal preference, a minimalistic look with seamless glass and clean lines may fit your vision. Or perhaps, the traditional and classic look of natural stone or wood may be more your style. The choice of materials that you use during construction especially in terms of flooring and doors can impact the cost significantly. A bare-bones, 6’x6’ cellar could cost $10,000 while an elaborate 30’ x 30’ wine cathedral could run upwards of $100,000 well-designed cellar can cost anywhere from $5,000 and up. The sky is the limit when it comes to wine storage costs. Even if you are locating your cellar in a basement which is cooler than the rest of your house, a cooling unit is vital to maintaining a consistent humidity and temperature. Purchasing the right size and type of cooling unit for your wine storage is an essential part of the installation process. Depending on the location and size of your wine cellar, there are various options. The core cooling unit options available are self-contained units, split units and ducted systems. A self-contained unit contains both the heating and cooling elements in the one package. These are most often installed with the cooling element facing the cellar and the heating element facing a space adjacent to the wine cellar. A split cooling unit can be more expensive but provide you with the ability to place the condensing unit in a different location to your wine cellar. Both self-contained and split units can be ducted systems. Consulting with an HVAC contractor can help you in making the right choice for your cellar. Cooling units can cost between $800 for a small 300 cubic foot unit and $10,000 for split-ducted units that can cool up to 8500 cubic feet. When it comes to accessibility and racking options, it is important for wine to be stored in a manner that is both convenient and will allow for you to retrieve the bottle without risking damage your wine collection. Numerous options are available such as wine cabinets, metal or cable wine trellis racking, wooden racking and glass encasement. 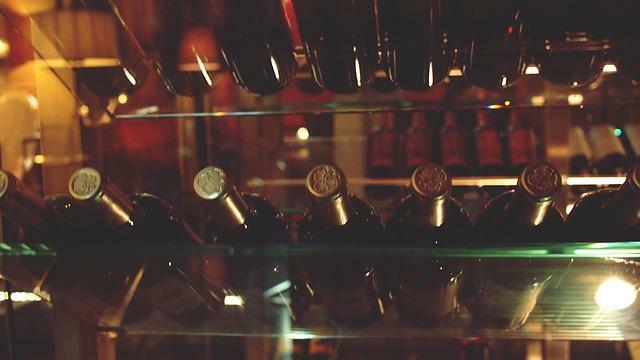 Depending on how you would like to display your wine may affect your racking options. For example, some enophiles may prefer titled racks to display individual bottles while others may prefer wooden shelves for case storage. Racking can cost anywhere from $1 to 20 per bottle stored. Your wine collection deserves to become a focal point of your home. With the correct preparation and planning, you can ensure that your wine cellar vision is designed correctly and perfectly for your property.